I have been meaning to sketch these three shops on Dundas Street for ages, I love the mixture of colours, railings and Georgian architecture. I must pass by this trio of New Town stores most days, usually whizzing by on the bike or car but this week I passed with time to spare so pulled up to create my sketch. 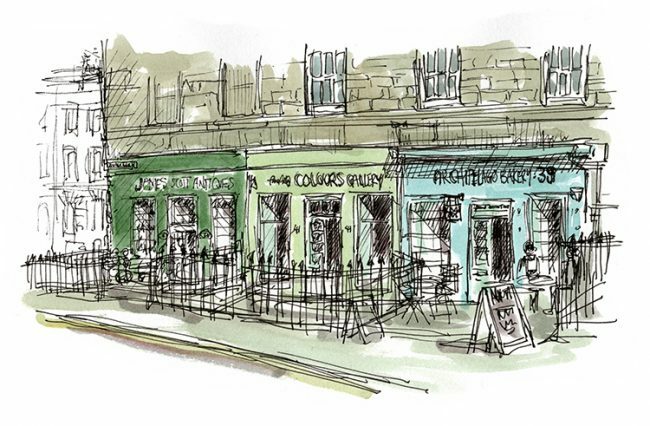 I thought it would make a great WhereArtI competition sketch, so used that without the shop names HERE. The lose and random lines of the railings make this sketch for me, they are obviously all not in the correct place but I love the haphazard way I have drawn it. I hope you like it too, actually if you would like a print just leave me a comment. I usually print in two sizes 150x100mm for £18 and 297x210mm for £32. Both of these sizes come with mounts, but if you would like a bespoke size just let me know and I will quote you a price. James Scott Antiques, Colours Gallery, and Archipelago Bakery.